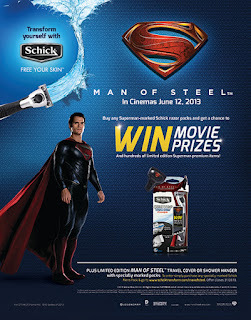 Schick razor has a promo in a tribute to the upcoming “Man of Steel” movie directed by Zack Snyder and produced by Christopher Nolan. “Man of Steel” promises to give a more relevant twist to the timeless character that we have come to love as heartthrob Henry Cavill portrays the role. Special edition Superman “Man of Steel” Schick packs are now available. These special packs include Exacta 2 disposables, kits and refill, Quattro Titanium and Freestyle systems and refills. If Schick can transform me to be a Woman of Steel for a week, I would use the opportunity to make a difference in the lives of as many people as I can. I will use my ability to help people caught in fires, accidents and acts of nature since I have a higher resistance to one or more forms of damage. My superhuman powers will enable me to exert myself in adversities for long periods of time with tiring out. So join me on June 12, 2013 movie screening. Click on the poster for more information. This promotion is brought to you by: Schick. Free Your Skin. Per DTI-NCR Permit No.1843 Series of 2013.